This outdoor party will be hosted by the Blue Mountains Public Library, the Town of the Blue Mountains and the Thornbury-Clarksburg Rotary Club. Featuring Black Angus BBQ, local food vendors, a bar, children’s activities, an amazing local band Graham Playford and the Flying J’s and a large fireworks display. Kick of your Canada Day weekend with us! 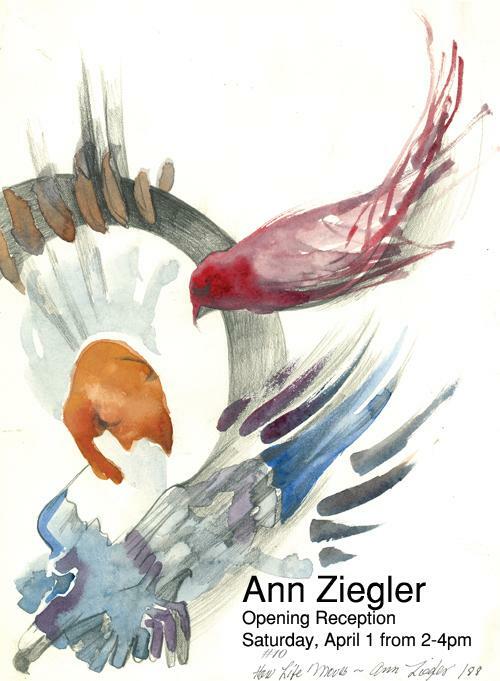 Ann Ziegler's art is a mixture of drawn and painted images: monoprints, collage, acrylics, watercolours and mixed media pieces. Her show runs April 1-30. In August 2016, Linda Pim, a member of the Beaver Valley Bruce Trail Club, spent nine days aboard a Russian research/passsenger ship sailing through the Northwest Passage, retracing the route of the Franklin Expedition. Join us, as Linda shares her knowledge of the history and culture of the Northwest Passage. A drop-in program. April is Canadian Film Month and we are partnering with Mountain Goat Film Company to bring their local documentary, "Snow People" to a wider audience. "Snow People" explores the stories, people, and the history of sports culture in the Blue Mountains. See the film and take part in a Q&A session with the creators afterwards. This new short film will be screened at the L.E. Shore Memorial Library on Thursday April 20th at 6:30pm. Watch the trailer. A drop-in program. In this class, Richard "the Computer Guy" Banks will cover setting up a business page, adding co-editors, and advertising. This will be a small group, so register here soon. Spiritual teacher and guide, Eva Smith will be at the L.E. Shore Memorial Library to give her talk on the Road to Fulfillment. Eva holds a Doctorate in the Science of Esotericism from the University of the Seven Rays and was a co-founder of Toronto’s Centre for Esoteric Studies. She has taught courses in esoteric psychology, astrology and cosmology. Her greatest desire is to help people live more consciously. Eva will be talking about this desire and will also give astrological chart readings. A drop-in program. The Library Homeschool Group is for anyone in The Town of the Blue Mountains region. Meet and connect with other families who are already homeschooling or are thinking about homeschooling. This group is for any method of schooling and any background. This year is all about Canada 150, 12 months, 12 themes. April’s theme is FILM. Join us for our Homeschool Program at L.E. Shore Memorial Library on Friday April 28th from 2pm-3pm. The Community Cookbook Team, Blue Mountains Public Library and Arts Advisory Council are hosting a Community Cookbook: Come to our Table Social Evening at the L.E. Shore Memorial Library on Thursday May 25th. Doors open at 6:30pm. Tickets will be $5 and available closer to the date. Featuring sample appetizers from the cookbook, a beverage from Duxbury Cider, live music from local musician Krista Currie, and brief talks from Bruce Wine Bar, Sideroad Farm, and local poet, Elizabeth Zetlin and more of the cookbook contributors. This evening will celebrate local farmers, restaurants, artists, storytellers, cideries/wineries and culture. Toddler Story Time (10:45am-11:30am). Every week is a different theme and will feature stories, rhymes, songs and crafts for tots. Drop-in program. Baby Play Time (1-1:30pm). Hands-on play time dedicated to helping infants build up their sensory experiences. An adult must accompany children. Ages 0-24 months. Drop-in program. Children's iPads are available for 1-hour loan at the library. They are loaded with educational apps for younger children. Ask for one at the front desk when you visit next time with your kids. Join us for an exciting afternoon screening of Historica Canada's suite of Heritage Minutes at the Craigleith Community Centre on April 6th. Watch the Minutes you've never seen before, learn about the breadth of Canada's history, and uncover stories connected to the local area. Audience members will also be able to play "Got A Minute? Pin A Minute!" where they can share who they'd like to see appear in a Town of the Blue Mountains Heritage Minute! Tickets are free but required; pick up at either Blue Mountains Public Library branch. The Craigleith Heritage Depot is pleased to present two screenings of the new documentary "Snow People" (2016), created by local company Mountain Goat Film, at the Craigleith Community Centre on April 19. This day is particularly significant because it is also Canadian Film Day! At either 1:30pm or 6:30pm, you can see the film and then take part in a Q & A with its creators in the charming, historic setting of the Craigleith Community Centre, just a few seconds from the Craigleith Heritage Depot. Want to know more? You can see a trailer for "Snow People" here. Seating is limited, so pick up a ticket at either branch of the Blue Mountains Public Library or call 519-599-3131 ext. 370 to reserve some. Enjoy a fun afternoon screening of the excellent film "The Jazzman" (2009) about famous jazz musician Mo Koffman. Produced by local filmmaker Tom Strnad and directed by Mo Koffman's own grandson! Free event but ticket required; pick up at either BMPL branch. Please note that this event takes place at the Craigleith Community Centre, not the Craigleith Heritage Depot. The Craigleith Heritage Depot will be closed on Easter weekend from Friday, April 14 to Monday April 17, inclusive. We apologize for any inconvenience. Please leave any library materials in the drop box just outside the front door. We wish all of our patrons and visitors a happy holiday weekend.